I have presented several planetarium shows, both for the general public and for school groups. In addition, I developed several original special topics presentations including The Rosetta Mission: Chasing Comets, The Search for Earth 2.0, Cosmic Collisions, and Life in the Universe. Click here to read the Daily Bruin article! When Philae woke up in July 2015, we got a front row seat as a comet swung around the Sun for the first time in human history! This planetarium show reviews the basics of comets, and describes the history of the Rosetta Mission. 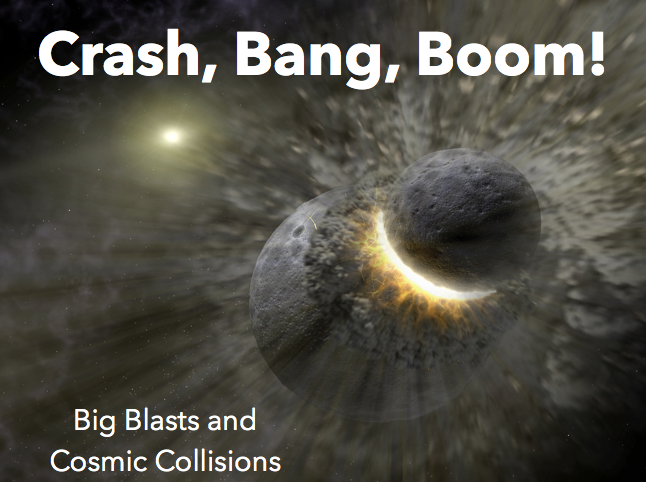 Explosions happen everywhere in the universe on a wide variety of scales. Almost all of them are crucial to the development to life on Earth. From the formation of the Moon to the biggest explosions in the Universe - supernovae eruptions - this show covers everything! What makes Earth special? Why has it been so difficult for astronomers to find "Earth 2.0"? This show attempts to answer those questions in light of the recent discovery of the most Earth-like exoplanet found to date - Kepler 452b. When and how did life on Earth begin? Where in the Solar System might we find alien life? Are there aliens in the Milky Way Galaxy? If so, why haven't we heard from E.T. yet? While some of these questions are yet unanswered by astronomers, this show reviews what we do know about life in the universe. This show was originally written by fellow graduate student Quinn Konopacky. I updated it in 2015 to reflect recent astronomical findings.